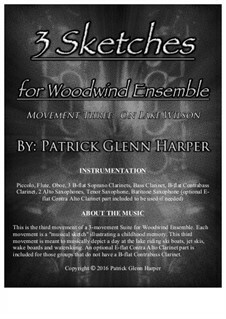 This is the third movement of a 3-movement Suite for Woodwind Ensemble. Each movement is a "musical sketch" illustrating a childhood memory. This third movement is meant to musically depict a day at the lake riding ski boats, jet skis, wake boards and waterskiing. An optional E-flat Contra Alto Clarinet part is included for those groups that do not have a B-flat Contrabass Clarinet.